Chengdu J-9 (Chinese: 歼-9) was a designation assigned to a Chinese interceptor aircraft that never progressed beyond initial studies. The J-9 was scrapped in favour of the Shenyang J-8, which was a safer technological bet for the limited Chinese aviation industry of the 1960s and 1970s. 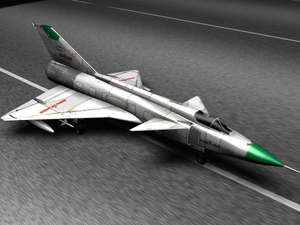 The J-9 designation is frequently confused with the much later Chengdu FC-1 fighter which is sometimes informally referred to as J-9 by aviation enthusiasts. In late 1964 two indigenous fighter programs were initiated to follow up the MiG-21. The twin engine project using the MiG-21's R-11F-300 powerplants was the J-8. The J-9 project ran in parallel with the J-8 project, but used a completely new single engine airframe. It adopted the canard layout. The designed target maximum speed was originally Mach 2.4 at above 20,000 metres (66,000 ft) of altitude. In order to achieve this target, the J-9 was fitted with an 8,500kgf (19,000lbf)-thrust turbojet engine and the 601 Institute initially used a tailless delta design. Development at this point shifted to the newly built 611 Institute and the Chengdu Aircraft Factory. At the beginning of the 1970s, the 611 Institute proposed a new design using a canard ahead of the delta wing (similar to the Swedish Viggen), but because it required new materials and know-how (plus having engine performance problems), it was not until 1975 that the design could be completed. The new J-9 design had air intakes on the fuselage sides featuring variable inlet geometry to alter the compression mixture. It used a Chinese designed WS-6 turbofan engine with 12,400 kgf (27,000lbf) afterburning thrust, and featured a Type 205 radar (with a search range of about 70 km) and four PL-4 radar-guided air-to-air missiles. The J-9 plan was discontinued in 1980, but the J-9 development enabled Chinese engineers to gain experience with the canard layout type, experience that would prove useful in the J-10 project. The J-9 was cancelled primarily due to the inability to produce the specified WS-6 turbofan engine. Turbofan engine technology would remain a bottleneck for Chinese aviation until the 1990s. The program was also severely disrupted by the Cultural Revolution. The constantly shifting and unrealistic speed and altitude targets placed by the People's Liberation Army Airforce (PLAAF) frustrated the efforts of the J-9 design team. For example PLAAF demanded the top speed increased to Mach 2.8 with max altitude of 28,000 metres (92,000 ft). Efforts by the designers to lobby for less ambitious speed and altitude requirements as well as to place greater emphasis on range and agility met heavy resistance. The J-8 project was deemed more conventional and lower risk from the start and received funding priority.